Dolch Sight Word List Labels for storing your dolch sight words. 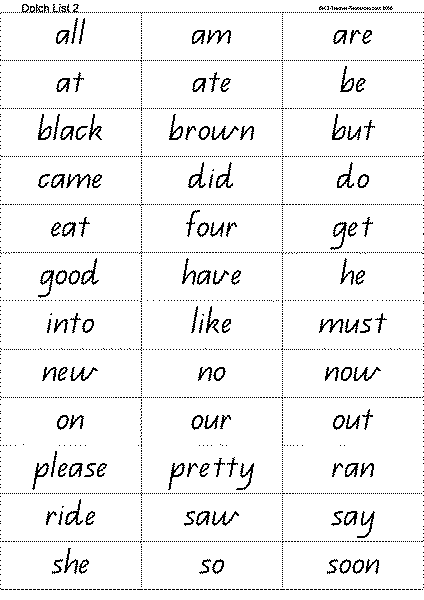 Take home size dolch sight words to print. I extend the YES/ NO game by printing the DOLCH words (small print) ,cutting up the lists and laminating them & including them in the YES /NO packet. Use a blank card to put ?’s about these words e.g. how many times can you find these words in Chapter 2? Chn. list the results on a whiteboard. My school uses the Magic 100-300 word lists. Any chance you could look into adding this?? Thanks!